The missing dead call to Violet. They want to be found. Violet can sense the echoes of those who've been murdered—and the matching imprint that clings to their killers. Only those closest to her know what she is capable of, but when she discovers the body of a young boy she also draws the attention of the FBI, threatening her entire way of life. As Violet works to keep her morbid ability a secret, she unwittingly becomes the object of a dangerous obsession. Normally she'd turn to her best friend, Jay, except now that they are officially a couple, the rules of their relationship seem to have changed. And with Jay spending more and more time with his new friend Mike, Violet is left with too much time on her hands as she wonders where things went wrong. But when she fills the void by digging into Mike's tragic family history, she stumbles upon a dark truth that could put everyone in danger. I was so super excited to read this one! I absolutely adored The Body Finder, which I read earlier in the year, and have eagerly anticipated reading the sequel ever since. 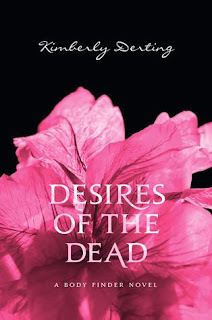 A big thank you to Sam at Headline for sending me Desires of the Dead by Kimberly Derting for review, I am eternally grateful and it definitely lived up to all of my very high expectations! I really love both Violet and Jay as characters, Violet especially. She has this really unique gift of sensing the dead around her. It's a gift that only her close family and best friend/recently turned boyfriend, Jay know about. But then, when the body of a highly publicised missing boy calls out to Violet and she makes an anonymous phone call to the police, things begin to change. A woman who works for the FBI becomes aware of Violet and seems to know that Violet is hiding something big. She feels under pressure from the FBI woman to admit to her special gift, and Violet begins to question this life-long vow of secrecy that she's undertaken. Can Violet be able to handle the idea of more people outside her circle of trust knowing what she's capable of and why she keeps finding dead bodies? And at the same time, Violet feels really unsure of and slightly uncomfortable with Jay now that their relationship has changed from a friendship into something more physical. I do really, really love the relationship between Violet and Jay. As the reader, you can completely see without any doubt whatsoever that Jay is hopelessly devoted and loyal to Violet. I love that in a love interest, I really do. But Violet has trouble opening up to Jay, and for much of the novel leaves him in the dark to all of Violet's mounting troubles. Because there also is someone out there who isn't quite fond of our Violet. Sending threatening messages and a box in the middle of the night that would freak out absolutely anybody who wasn't Violet. When Violet begins to think that this mysterious mischief sender is somehow closer to home than anyone realised, the anticipation and tension really start to pick up. Like in the previous book, the narrative is interspersed with snippets of the thought processes of the person out to get Violet and it really adds to the suspense of the novel. I really love this mixture of mystery and romance that Kimberly Derting pairs together so well! Fans of Violet and Jay will not be disappointed with the levels of heartbreak and swooniness, but there is enough outside of their relationship in order to keep anyone else interested as well. A truly fantastic sequel and one not to miss! Squee! I am so excited about this one. I can't wait to read it. Thank you so much for sending me the second copy to read. It is next on my list! I have both the Body Finder and the Desires of the Dead in mt TBR pile! I can't wait to read them!! I did like the first book in this series for the most part. I should get around to reading this one! Vivienne - I really hope you enjoy it :) I think it's a great continuation of the series and I'm desperate to see what happens next! Becca - You're in for a treat then :) They're both really wonderful! Jesse - Oh you definitely can't skip reading The Body Finder and Desires of the Dead! Such fun books.